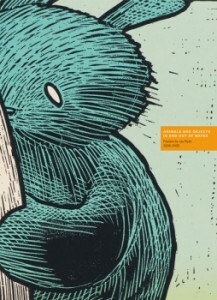 Gig poster maker extraordinaire Jay Ryan is set to release “Animals and Objects in and Out of Water,” a book showing off some of his favorite work from 2005-2008. The book collects over 100 images of posters and includes information on each print. The book also features an introduction by, you guessed it, Andrew Bird, for whom Jay Ryan has produced some spectacular artwork over the years. Orders made directly through The Bird Machine (Ryan’s poster workshop) feature an exclusive four-color screenprinted sleeve and will be signed. Books can be purchased using the Paypal address provided on The Bird Machine’s website. Ryan will be embarking on a book tour in November with graphic artist Paul Hornschemeir, who also has a new book out. Tour dates include Chicago, Milwaukee, New York, Los Angeles, and Portland, among many others. Ryan hits Chicago on November 11th at Quimby’s Bookstore (1854 W. North Ave.), and Milwaukee the next night at The Sugar Maple (441 E Lincoln Ave., Milwaukee, WI). I’ll probably be heading to Quimby’s to check it out. The complete tour schedule is available on Ryan’s website. In other news for which I’ve been waiting for several months, a special series of Andrew Bird concerts was announced today. He’ll be performing a series of five shows — two in Minneapolis and three in Chicago — in mid-December, solo and mostly instrumental. These shows have been rumored to be happening since he mentioned the idea in passing during an interview at Lollapalooza, but this is the first they’ve been announced. The shows are being called the “Gezelligheid Concerts”, with gezelligheid apparently being a Dutch word which roughly translates to “intensely cosy”. The Minneapolis shows will take place on December 10 and 11 at St. Mark’s Episcopal Cathedral. Seating is general admission and tickets are $34 for front of room and $29 for back of room. 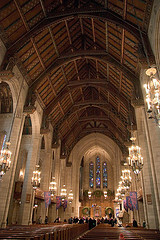 The Chicago shows take place on December 15, 16, and 17 at the historic and gorgeous Fourth Presbyterian Church. Again, seating is general admission and tickets are $40 for front of room and side balcony, and $35 for back of room and rear balcony. Tickets are available now via internet presale at Music Today. General sale starts on October 23 for the Minneapolis shows and and November 7 for Chicago. After wrapping up a tour of Asia in early 2010, Andrew is scheduled to take a break from touring, so for the most part, this may be the last opportunity to see him in the area for a while. I will, of course, be there all three nights (and if Minneapolis weren’t so far away, I’d probably be trying to figure out how to get to those, too). Edited to add: Less than 24 hours later and the presale tickets are all gone. Cross your fingers and click quickly during the regular sale, my friends. I am definitely excited. They’re sure to be some very special performances. I’ll definitely be reporting back… now if only I could just press fast forward on life to get to December more quickly!